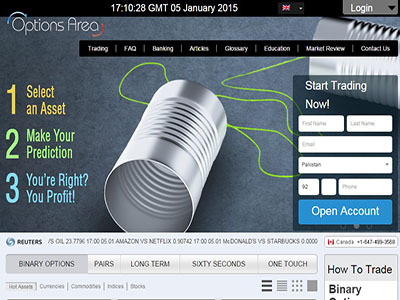 Is Options Area A Good Or Bad Binary Options Broker? Options Area are no longer trading. For a list of alternative brokers, and full comparison reviews, visit our brokers page. OptionsArea is a newly established binary broker that is owned by a holding company called Dolce Formula Ltd. Although, their headquarters are based in Mahe, Seychelles, OptionsArea also maintain satellite offices in countries like Australia, Canada and the UK. While Optionsarea may be a new broker on the binary trading scene, they have been getting some serious attention from traders. At this point, we were not entirely sure about what was so attractive about this broker, so we decided to conduct an in-depth review to find out more. We hope at the end of this review, you will be in a better position to evaluate the quality of Optionsareas’ services. A quick glance at Optionsarea’s trading platform reveals that it is powered by the SpotOption engine. While there is really nothing too exciting to shout about this platform, it is worthwhile to note that it is a well tested and reliable platform. In fact, the version which Optionsarea is using, is the second generation with improved features built into it. Now traders have the ability to trade “Pairs”, short term and Long term options with multiple expiry times. Nevertheless, you will find that all the popular features like the “Buy Me Out”, “Double Up” and “Roll Over” are still available with the SpotOption Gen 2 trading platform. With regards to trading accounts, Optionsarea only offer one standard type of trading account. Opening a trading account with them is hassle free and it just requires a minimum deposit of $/₤/€100 depending on the currency which your trading account is based upon. To fund their trading accounts, traders can do it with their credit/debit cards such as VISA, Mastercard, MAESTRO or Carte Bleue. Although methods of fund transfer such as WebMoney or Wire transfer are also available. For security reasons, all internet fund transfer transactions at Optionsarea are encrypted with 128 bits SSL encryption algorithms. Currently, Optionsarea’s website is available in 3 major European languages such as English, French and German. However, Optionsarea have recently announced that they will expand their language support to cover an additional 11 different languages. As for contacting the support team, this can be done through the usual channels like the email, telephone or live chat. While the payouts offered by Optionsarea might not be the highest in the binary trading industry, it is still considered to be on the high side. On average, the traders can expect a return ranging from 70% to 85% if their trades ended up in the money. For trades that ended up out of the money, traders are still entitled to a rebate of 10% on the money that they invested. As for bonuses, Optionsarea is constantly running promotional offers. To find out more about their current promotions, traders need to contact the customer support representatives. In our opinion, one of the key reasons why Optionsarea is popular among traders is the fact that they make it easy for anyone to trade. Everything is straight forward and there is no ceremony when it comes to opening a trading account and transferring funds. Nevertheless, we feel that while Optionsarea might be attractive for beginners, more sophisticated traders might want more out of their broker.